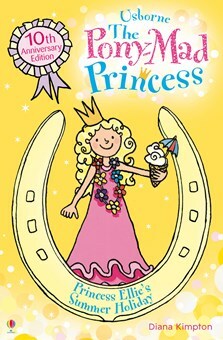 Full of authentic pony facts and sparkly princessy detail. The royal family are off on holiday to a beautiful island resort with its own local stables. There Ellie and Kate meet snooty Princess Clara, who always thinks she knows best. But when Clara gets herself into trouble, Ellie and Kate rush to her aid with the help of a very special pony called Mango. “It looks wonderful,” yelled Princess Ellie, as she stared out of the helicopter window. She had to shout to be heard above the roar of the engine. “Fantastic!” agreed her best friend, Kate, at the top of her voice. They both stared down, watching the tropical island come closer and closer. Its hills were covered with thick, green jungle, and blue sea lapped gently on its white, sandy beaches. It looked like the perfect place for a summer holiday. There was only one problem – there was no sign of any ponies. The helicopter landed gently on a patch of ground marked with an enormous H. The wind from its rotor blades sent up clouds of dust that blocked the view from the window. Then the engines finally stopped and all was quiet. “And ride,” added Ellie. “You promised there’d be riding.” She was starting to feel worried. If there weren’t any ponies, her holiday would be ruined. Ellie and Kate followed the King and Queen out of the helicopter. The sun was so bright that it dazzled them. The air was hot and the gentle breeze carried strange scents Ellie didn’t recognize. As soon as they were all on the ground, a crowd of smiling women ran forward and hung garlands of flowers around their necks. One of them accidentally knocked the King’s crown sideways, but he didn’t seem to mind. He just laughed as he pushed it straight. “Except me,” laughed Kate. Her gran was the palace cook. “And the maids and Higginbottom,” added Ellie. She glanced back at the helicopter where the butler was busy making sure all their luggage was unloaded. Don led the way to a white building with RECEPTION written on it in large gold letters. Inside, full-size palm trees grew in pots and goldfish swam lazily in a huge pool. While Don chatted to the King and Queen, the two girls looked around at the walls. There were photos of people waterskiing and sailing. There were notices about golf and fishing and tennis. But there was nothing at all about horse riding. Ellie tugged anxiously at her mum’s sleeve. “Ask about the ponies,” she begged. “In a minute, Aurelia,” replied the Queen. Ellie sighed. She knew from experience that that sort of minute often lasted several hours. Don picked up some keys from the desk. “Come with me and I’ll show you where you’re staying.” He led the royal group through the reception area and out the other side. “Wow,” cried Kate and Ellie together, as they stepped onto a wide, sun-soaked patio. Straight in front of them was an enormous swimming pool with water as blue as the sky. Beyond that lay a wide, sandy beach dotted with striped sun umbrellas. And on either side of the pool stood the villas for the guests, each with its own garden. Ellie was pleased to find their villa was at the far end, closest to the beach. It was totally different to the palace where she normally lived. It was much smaller, and it had a wide, shady veranda and a roof of green tiles. In the garden, hummingbirds flew from flower to flower and a fountain splashed gently into a shell-shaped pool. To Ellie’s surprise, Higginbottom opened the door to greet them. He was slightly out of breath from rushing to get there before they did, and his garland of flowers looked ridiculous on top of his evening suit. “Brilliant!” cried Ellie. She flung open the door and stared in delight at her holiday bedroom. It wasn’t pink like her bedroom at home. The tiled floor was creamy yellow and the covers on the two beds were bright orange. “I’m happy with this one,” said Ellie, as she bounced up and down on the other bed. Then she spotted an envelope on the dressing table. It had a drawing of a horse at the top, and it was addressed to Princess Aurelia and Kate Brown.